Year 2015 marks the 150th anniversary of the publication of Lewis Carroll's Alice's Adventures in Wonderland, one of the great works of children’s literature, comprising 12 chapters and a prefatory poem. As part of THE WONDERLAND PROJECT thirteen internationally renowned composers were initially commissioned to write short pieces, each inspired by a different chapter, to be performed in order so they follow the story's narrative. Subsequently, the Pharos Arts Foundation in collaboration with the International Motion Festival Cyprus held a ‘Call for works” where 13 different solo/teams of film-makers / animators from all over the world were selected, out of 127 applications, to create films corresponding to the music of each chapter. The result is a diverse, interesting and hugely exciting marrying of music and film! 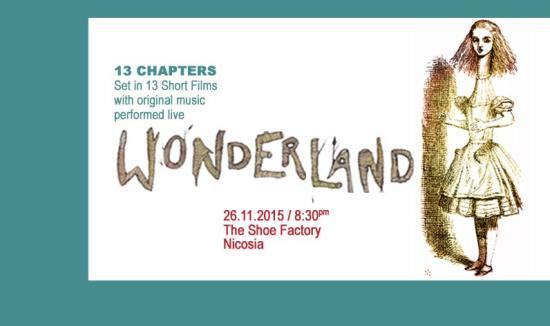 The world premiere of the Wonderland Project with screening of the films and simultaneous live performance of the music by Ashley Wass (piano) and Matthew Trusler (violin) will take place at The Shoe Factory in Nicosia, on 26 November 2015, to coincide with the month in which the hugely successful 2nd Edition of Alice in Wonderland was published. The Wonderland films and music will be released on CD & DVD by Orchid Classics in March 2016. All profits from the release will go to the Lenny Trusler Children’s Foundation – a foundation dedicated to providing relief from suffering and illness in very sick babies and children. Wonderland is intended to be the first of several projects designed to create a legacy of new music and film inspired by literature. CHAPTER ELEVEN - WHO STOLE THE TARTS?